The synovial membrane (SM) of affected joints in ankylosing spondylitis (AS) is infiltrated by germinal center-like aggregates (foci) of lymphocytes similar to rheumatoid arthritis (RA). We characterized the rearranged heavy chain variable segment (VH) genes in the SM for gene usage and the mutational pattern to elucidate the B lymphocyte involvement in AS. Cryosections from an AS-derived SM were stained for B and T lymphocytes. B cells were isolated from different areas of a focus. The rearranged VH genes were amplified by semi-nested polymerase chain reaction (PCR) using oligonucleotides specific for the six different VH families and heavy chain joining segments (JHs). PCR products were cloned and sequenced. Fifty-nine of 70 different heavy chain gene rearrangements were potentially functional. Most of the rearranged genes were mutated (range, 1–15%). Thirty of 70 products had a mutational pattern typical for antigen selection. Most of the rearranged VH genes belonged to the VH3 family (54%), consistent with data from healthy donors and patients with RA, while VH4 genes, in contrast to RA, were identified less frequently (10%) and VH5 genes were over-represented (11%). In contrast to RA, neither VH6 genes nor the autoimmunity-prone VH4-34 were seen, whereas another autoimmunity-prone gene, V3-23, was predominantly used (11%). One VH1-derived and one VH3-derived B cell clone were expanded. CDR3 were shorter and more variable in length than in RA. Comparable with RA and reactive arthritis, there is a biased repertoire of selected VH genes, whereas the panel of represented genes is different and less clonal expansion was observed. AS is an inflammatory rheumatic disease mainly involving the axial skeleton. Forty percent of AS patients develop periphery mono-/oligoarthritis . The SM of inflamed peripheral joints in AS (Fig. 1) in certain cases resembles RA with intense mononuclear cell infiltration forming foci similar to germinal centers (GC) that contain B and T lymphocytes as well as plasma cells [2,3]. Recent immunohistologic analysis of five AS SMs demonstrated B cell rich infiltrates in two cases, whereas no B cells were detected in the three others . The synovial focus. Double-immunohistological staining (anti-CD20 alkaline phosphatase-anti-alkaline phosphatase and anti-CD3 streptavidin biotin horseradish peroxidase reaction) of 8 μm sections from frozen SM obtained by total joint replacement of an AS patient's right hip (B cells, red staining; T cells, brown staining). The VH germline repertoire consists of 123 (44 functional) VH segments subdivided into seven VH families (see supplementary material). Antibodies are encoded by one VH segment rearranged to one or several of 25 heavy chain diversity segments (DHs) and one of six JHs . The locus of rearrangement, individual for each B lymphocyte clone, is the CDR3 . Only rearrangements with translatable nucleotide triplets lead to antibody formation, others are nonfunctional. There is a biased use of particular germline VH genes in the VH repertoire. An over-representation of VH4 genes in the autoimmune repertoire has been described [7,8]. A negative selection of VH4 takes place in the peripheral blood lymphocytes from healthy individuals as a means of avoiding autoimmunity . An antigen-driven immune response, characterized by a ratio of mutations leading to amino acid replacement to silent mutations (R:S ratio) >3  within the complementarity determining region (CDR), takes place within the GC of lymphatic organs. Similar clonal development of antibody VH genes has been demonstrated in the SM in RA patients [11,12,13,14,15] and in reactive arthritis (ReA) patients . The B cell subset in AS joints has not yet been characterized. We analyzed the repertoire and distribution of rearranged VH genes to elucidate B lymphocyte involvement in AS, and to investigate similarities to and differences from RA. A SM of the right hip was obtained from a 57-year-old man, who had suffered from AS for 30 years, requiring total endoprothetic joint replacement. Frozen sections (8 μm) of the immediately snap-frozen tissue sample were screened for B and T cells by double immunohistological staining with anti-CD20 and anti-CD3 monoclonal antibodies using the alkaline phosphatase–anti-alkaline phosphatase and streptavidin biotin horseradish peroxidase technique [17,18]. 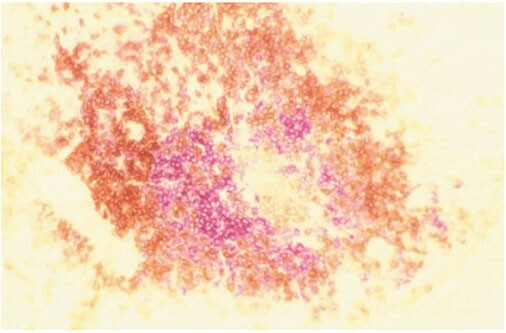 The stained B lymphocytes from serial sections taken at 50μm intervals were isolated by microdissection, and DNA preparation followed (see supplementary material). DNA was subjected to a semi-nested PCR for VH genes (see supplementary material). Thirty-five cycles of PCR, using a mix of six oligonucleotides specific for the different VH families as primers at the 5' end and a mix of oligonucleotides corresponding to the known JH overlapping to a part of the intron sequence as primers at the 3' end, were followed by 35 cycles with 1 μl of the first PCR products and individual VH and JH primers (at a more 5' position) (Table 1). A similar PCR without DNA was run as a negative control. All oligonucleotides contain a 5¢ SalI restriction site (G/TCGAC). The corresponding amino acid positions are presented in parentheses. The VH1 oligonucleotide also perfectly matches VH7. PCR products of the expected 350 base pair (bp) length were detected by standard agarose gel electrophoresis and purified. The purified DNA template was bacterially subcloned followed by plasmid isolation and sequencing. Sequences were analyzed by homology comparison with the EMBL and GenBank gene databases (see supplementary material). Immunohistological analysis of the inflamed SM revealed foci rich in B and T lymphocytes in a formation similar to GC (Fig. 1) . The B lymphocytes of one focus were isolated from four not directly consecutive sections about 50 μm apart (2c, 3a, 3b, 5c). An estimated number of 150 B lymphocytes could be isolated from each section. Except for the negative control, all VH PCRs led to a product of the expected length (350 bp). All sequences reported in the present paper are accessible on the EMBL database. 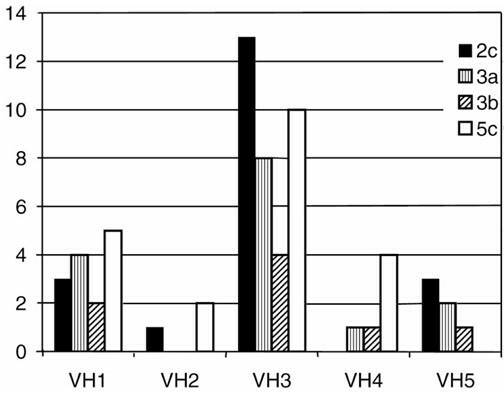 Seventy individually rearranged VH genes were characterized by sequence analysis (Table 2): 14 (20%) belonged to the VH1 family, 3 (4%) to VH2, 38 (54%) to VH3, 7 (10%) to VH4, and 8 (11%) belonged to the VH5 family. No sequences corresponded to VH6 (Fig. 2). Distribution of the VH families among the PCR products obtained from different slides (2c, 3a, 3b and 5c). Bars for each section represent the respective number of products for each indicated VH family. pf, Potentially functional; nf, nonfunctional. Referred germline genes: 'DP' ; 'HUMIGHCAG' and 'HUMIGHCAK' ; 'HUMIGVH2E' . EMBL accession numbers: AJ298233-44, AJ303356-58, AJ306240-68, AJ407969-98. * Identical to F5-3a4, F5-3b4, 5c-4m6. Twelve genes in all were nonfunctionally rearranged, with the highest proportion in VH3 (18%), about 14% in VH1, VH4 and VH5, and none in VH2. Fourteen individual rearrangements represented VH1 genes. The most often represented VH1 gene was DP75 (four products) followed by DP10, DP14, DP21 and DP25 (two products each). Out of 14 distinct VH1–DH–JH sequences, 2 were nonfunctional (14%). CDR3 lengths varied between 18 and 39 bp (mean, 28.5 bp). 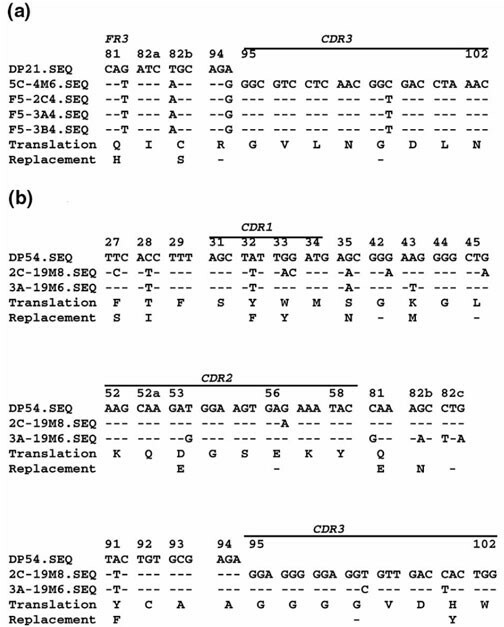 Four of the VH1 products (F5-2c4, F5-3a4, F5-3b4 and 5c-4m6) deriving from different slides had an identically rearranged CDR3 and consecutively represent members of an expanding B lymphocyte clone (Fig. 3a). With 99% homology to DP21, they shared three mutations within the framework region (FR). Complete nucleotide and amino acid sequences of expanded B cell clones (a) VH1 and (b) VH3 in comparison with their respective gl gene. The amino acid position and the CDR positions are marked. Dashes indicate identity to the corresponding character on top. Amino acid replacements are indicated in the last line. Five productively rearranged genes were highly mutated with a range of 12 (F5-3a3) to 29 mutations to their respective germline (gl) gene. The R:S ratio for the CDR was >3 and lower for the FR, indicating antigen-driven mutation . Three different VH2 rearrangements were determined. All were potentially functional and > 95% homologous to the respective gl gene. The number of mutations ranged from 2 (5c-VH22s) to 10 (5c-VH26s). R:S ratios were quite low, with a maximum of 2.0 in the CDR (5c-VH26s). CDR3 lengths varied between 15 and 45 bp (mean, 32 bp). Thirty-eight different VH3 rearrangements were characterized: eight were most homologous to DP47/V3-23 (21%), five to DP50 (13%), four each to DP54 and DP31 (11%), respectively, and three each to DP49, DP35, DP51 and DP77 (8%), respectively. Seven (18.4%) VH3 genes were nonfunctionally rearranged. CDR3 lengths varied from 6 to 35 bp (mean, 27.2 bp). One case of clonal expansion within the VH3 genes was observed, represented by the VH3–JH4 rearrangements 3a-19m6 and 2c-19m8 (Fig. 3b). These genes, with 95.5% homology to DP54, shared four replacement mutations, and six mutations each were localized at different positions. Twenty-three of the VH3 sequences were highly mutated (10–27 mutations). Except for one case, most of the mutations were localized in the CDR with R:S ratio >3. Three of seven nonfunctionally rearranged genes also revealed a pattern of antigen-induced mutation. Seven different VH4 rearrangements could be characterized; six were potentially functional. CDR3 lengths ranged from 12 to 45 bp (mean, 28 bp). The gl genes HUMIGHCAK, HUMIGHCAG and DP63 were represented twice each, and DP71 once. No homology to DP64/VH4-34/VH4.21 was seen. Five of the sequences had few mutations (one to eight) with a R:S ratio higher in the FR than in the CDR. Two VH4 rearrangements had a R:S ratio >3 in the CDR (5c-VH44a and 3b-VH45a). Eight distinct VH5 rearrangements could be determined; seven were potentially functional. CDR3 lengths ranged from 12 to 66 bp (mean, 39.8 bp). The 3a-VH54s gene was unmutated. There were 7–35 mutations in all other sequences. For five sequences (four were potentially functional), the mutational pattern revealed antigen induction. 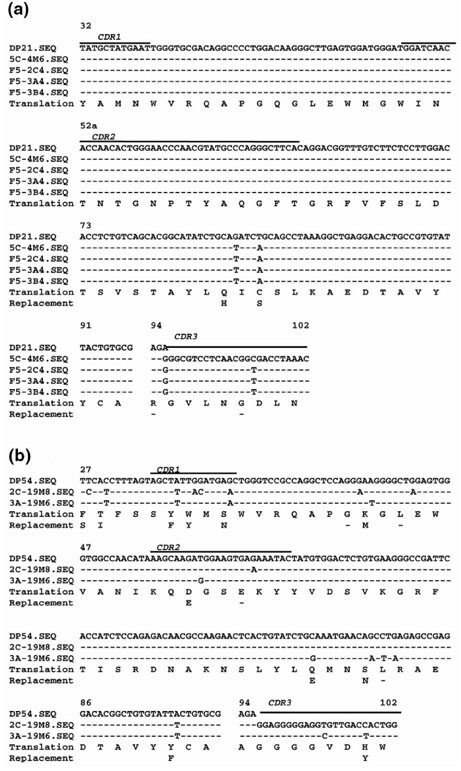 Analysis of rearranged VH genes from B lymphocyte DNA by PCR and sequencing enabled characterization of the clonal expansion and mutational patterns without bias due to cell isolation procedures. By semi-nested PCR, otherwise used for single-cell analysis , one sole VH–DH–JH rearrangement might be identified. Besides the extreme sensitivity, there is a high risk of artificial amplifications because of contamination. A negative control without DNA was run with each PCR as a precaution: no contamination was detected. We cannot exclude the fact that highly mutated genes are amplified less efficiently . However, since the respective data concerning RA and ReA have been established by similar PCR approaches [11,12,13,14,15,16], a comparison is possible. Within 70 VH–DH–JH rearrangements characterized in this study, all known human VH families except VH6 were represented. The descending order of representation was: VH3 (54%), VH1 (20%), VH5 (11%), VH4 (10%), VH2 (4%). Compared with the germline representation , an over-representation of VH5 and an under-representation of VH4 genes were remarkable. The representation of VH1, VH2 and VH3 genes corresponded to their respective germline representation. Our previous studies of the VH gene repertoire in RA SM  and studies using a hybridoma approach  revealed an over-representation of VH4 and a biased set of represented VH4 genes. A positive selection of VH4 genes, particularly within the plasma cell subset, was recently demonstrated in RA and ReA . The DP64/VH4-34/VH4.21 gene encoding anti-I and anti-i specificity of cold agglutinins [21,22], as well as anti-DNA antibodies in lupus erythmatosus , was not detected within the VH4 genes from AS SM. Another autoimmunity-prone gene, the DP47/V3-23 gene, was also predominant in AS. All of eight V3-23-derived genes were potentially functional rearrangements with >3% mutations to the gl sequence, and four reveal a R:S ratio >3 within the CDR that indicates a selection by antigen. V3-23 was also predominant in RA SM . A comparison of the peripheral repertoire revealed that V3-23 was more often somatically mutated in RA than in healthy controls [9,25,26]. Except for VH4, VH5 and VH6, the representation of VH genes was similar to results from the peripheral VH repertoire from healthy donors [27,9] as well as from a RA patient . Only two cases of clonal expansion characterized by identically rearranged segments were detected on different slides. An accumulation of further point mutations in the course of intraclonal diversification was seen in two offspring of a VH3 clone (both share four mutations and differ in six point mutations). Studies on plasma cells in ReA and RA SMs  reveal clonal expansion. In RA SMs, clonal B lymphocyte expansion in different areas of the tissue samples [11,15] and recirculation within different joints and blood were reported . The CDR3 lengths of genes from the AS samples were short, with a median of 27.2 nucleotides. A high variability, particularly in the productively rearranged subset and in the VH5 family, was noted. A similarly high variability was shown for polyreactive antibodies and rheumatic factors in RA . Our data from RA SM revealed almost homogeneous CDR3 lengths of intermediate size . CDR3 were much longer in the healthy peripheral repertoire, particularly within nonfunctional rearrangements (mean, 54 nucleotides) . Only nine rearrangements were not mutated. R:S ratios >3 within the CDR were observed in 30 genes (two were nonfunctional). Members of the VH1, VH3, VH4 and VH5 families carried more somatic mutations than the VH2 genes. Mutational pattern and frequency determine about one half of the characterized genes as memory B cells that probably stay in contact with persistent antigens in the micro-environment of the synovial foci . A similar accumulation of memory cells in RA SM has been reported [12,31]. Besides the highly mutated genes already described, one half of the characterized genes showed no evidence of antigen-induced mutations with low R:S ratios within the CDR. There was a bias to silent mutations in four highly mutated genes (2c-3m4b, 2c-21m3, 3a-19m8 and 2c-17m9). This pattern of mutations has been described for cold agglutinins , as well as for rheumatic factors, as a mechanism of selection against amino acid replacement to prevent the generation of high-affinity autoantibodies . Except for VH2 (none) and VH3 (18%), nonfunctional rearrangements had an equal proportion of 13–14% in each family within the genes characterized in the present paper. Except for a bias to VH4, a similar overall proportion of nonfunctional rearrangements was seen in the peripheral blood of healthy donors using single-cell PCR of genomic DNA . In contrast, no bias to elevated CDR3 lengths was seen. An active immune reaction with GC formation occurs in the inflamed SM in AS. B cell affinity maturation with generation of somatically mutated antibody-coding genes characteristic for memory cells occurs in these GC formations, indicating an antigen-driven response. Comparable with RA and ReA, there is a biased repertoire of selected VH genes, whereas the panel of represented genes is different and clonal expansion was observed less frequently. By sequence homology of at least 80%, the VH gene segments are classified into seven families. The VH1 family has 14 members (9 genes with open reading frames), VH2 has 4 (3 genes with open reading frames), VH3 has 65 (22 genes with open reading frames), VH4 has 32 (7 genes with open reading frames), VH5 has 2, VH6 has 1, and VH7 has 5 members (1 gene with an open reading frame), respectively . After the addition of 40 μl H2O, 0.1 volume of 10 × PCR buffer (mentioned later), 1% Triton X-100 and 0.5 μl Pro-teinase K (100 μg/ml; Merck, Darmstadt, Germany) was added and mixed. The volume was adapted to 80 μl by addition of H2O. The sample was incubated over 45 min at 55°C. After inactivation of proteinase (95°C), 25 μl of the solution was subjected to the first PCR. First PCR. An oligonucleotide mix of VH1, VH2, VH3, VH4, VH5, VH6 and an oligonucleotide mix of JH-Intron 1,2-4,5 and JH-Intron 3,6 as primers (final concentration, 0.125 μM each), 200 μM dNTP, 2 mM MgCl2, 1 U Goldstar Taq-polymerase (Eurogentec, Seraing, Belgium), and the manufacturer's reaction buffer. First cycle: 5 min denaturation at 95°C, 3 min annealing at 58°C and 90 second extension at 72°C; cycles 2–35, 80 second denaturation, 30 second annealing, and 90 second extension, with a final extension of 5 min. Second PCR. One microliter of the product of the first PCR with individual oligonucleotide primers VH1–VH6 and JH1–JH6, under the same conditions as the first PCR except for annealing for VH1, VH2, VH5, VH6 at 58°C, and for VH3 and VH4 at 63°C. DNA purification and plasmid ligation were performed with commercial kits following the manufacturer's instructions: DNA purification from the agarose-gel with the QUIAquick kit (Quiagen, Hilden, Germany), and bacterial cloning with the TA-cloning kit (Invitrogen, Leek, The Netherlands). For DNA sequence homology search and sequence comparison, DNASIS software (Hitachi Europe, Olivet, France), and EMBL Nucleotide Sequence Submissions (European Bioinformatics Institute, Wellcome Trust Genome Campus, Cambridge, UK) were used. The GenBank (National Institutes of Health, Bethesda, MD, USA) was also used. This work was supported by Deutsche Forschungsgemeinschaft Ga320, 3-1.